Indian Railway is the largest public sector unit where more than million people work. Every year thousands of people join the diverse team in Railway department in several ranks across the country. Depending upon diverse ranks and positions, the employees receive their salary. Also Indian Railway employees receive several allowances, advances and other benefits during their service and even after retirement. In the last pay commission, i.e. 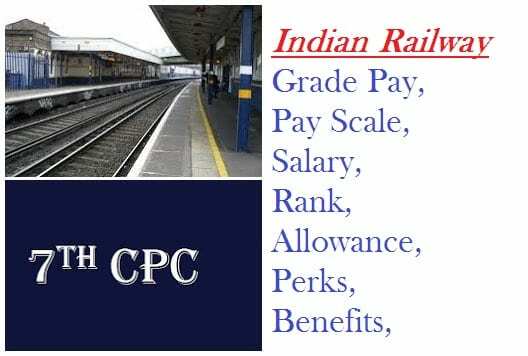 7th CPC, the authority has announced the projected salary and other benefits for the employees of Indian Railway. In this article you will find the pay scale and other benefits about the Indian Railway ranks and so. In recent times, according to the 7th pay commission the pay scale and grade pay of various positions in Indian railway has increased. As per the railway boards and 7th CPC, there will be a hike of salary of railway employees by at least 2.5 times and maximum 3 times. According to the projected revised salary hike, people working under Pay Band 1 who are drawing salary of Rs. 5200/- at this time will get salary of minimum Rs. 13000/- and if the salary gets hiked 3 times then they will draw the salary of Rs. 15,600/-. Under pay band 2 where the salary range is from Rs. 9300/- to Rs. 34, 800/- will be raised to the range Rs. 23, 250/- to Rs. 87, 000/- which is definitely a big jump. In a same way people under other pay bands will also get a hike in their salary, as per the 7th pay commission. The highest salary will be drawn by the people working under pay band 4, where the revised salary will be Rs. 1, 12,000/- including the grade pay of Rs. 30, 000/-. There are quite a large number of ranks and positions are there in the Indian Railways. Obviously there pay scales are different as per their duty and positions. There are many ranks and positions which are being discussed in here. Pay band 1: The workers who work under the pay band 1 such as senior commercial clerks, senior transit clerks and so on are drawing salary of Rs. 5200/- to Rs. 20, 200/- which will be raised to Rs. 15, 600/- to Rs. 50, 500/- after 7th pay commission. Pay band 3: under pay band 3, there are employees such as senior grade post grads teachers, selection grade teachers (post graduate) and so on. These employees draw salary of Rs. 15,600/- to Rs. 39, 100/- which will be hiked to Rs. 39, 000/- to Rs. 97, 750/-. Pay band 4: under pay band 4, the employees used to get Rs. 37, 400/- to Rs. 67,000/-. Now they will get Rs. 93, 500/- to Rs. 1, 67, 500/- after 7th pay commission announcement. Then the fixed transport allowance is being added to the basic pay + DA + HRA. Total Salary: Pay + GP + DA + HRA +TA. The Grade pay is being paid to all the employees excluding some senior officers. These Grade Pays are set based on the positions and ranks. Junior employees draw grade pay of Rs. 1800/- whereas the seniors receive grade pay of up to Rs. 10, 000/-. As the 7th pay commission has declared the grade pay has also risen 3 times from the previous amount. Now the junior officers and other employees who fall under pay band 1 will draw the grade pay of Rs. 5400/- to Rs. 8400/-. The people working under pay band 2 will get grade pay of Rs. 12, 600/- to Rs. 14,400/-. Similarly under pay band 3 and pay band 4, employees will receive grade pay of Rs. 16, 200/- to Rs. 22, 800/- and Rs. 26, 100/- to Rs. 30, 000/- respectively. Indian Railways have immense number of ranks and designations across the department. There are some of the prominent categories are commercial department, traffic transportation, traffic running, civil, electrical, telecommunication and mechanical engineering, stores, medical, general and teaching department along with RPF officers. The ranks are diverse in these categories such as junior engineers, junior section engineers, senior section engineers, commercial clerks, commercial superintendent, ministerial staff, lab, nurse and doctors under medical department, technical supervisors, depot material superintendent under store department, senior technical and design engineer under telecommunication engineering department and lo more ranks are there in the Railway Department. Some of the senior posts are district engineer and station superintendent along with commercial clerks and such. Continuous leave can’t be more than 5 years. Medical staffs can’t take leave without any information if the employees are in charge of any crucial case. If staffs are recalled to the duty before completion of the leave then the duty will be considered as compulsory duty. These are some of many leave rules under Indian Railway department.